As a people person and a busy mom, I often feel fragmented when different segments of life seem stitched together by various interactions with family and friends, whether in person or through technology. Tweets, play dates, coffee dates, Facebook chats, blog posts, after-school programs, or church activities are all good things, but no matter how completely connected I am, part of me misses out on being mentored. After all, I’m just now hitting my stride as a woman, and realize I could benefit tremendously by learning from someone who knows womanhood well. Because I believe it’s better to give than to receive and I wasn’t being mentored in any of the many areas of my life, I thought, why not mentor in a particular area in the life of another? This idea moved me to accept a request from Sus Schmitt, creator of eQuipping for eMinistry, to mentor fellow Cru staff women by helping them with their blogs. After some time passed, I was blogging through the streets of London (while ministering to Olympic athletes) when Sus asked if I could help Nan McCullough. It just seemed like a good fit to mentor Nan in blogging since I too have a heart for hosting people in my home with the hope of pointing them to Christ. Now here I am a month or two later, discovering the truth in Proverbs 11:25 that she who refreshes others will herself be refreshed. Nan’s experience in hospitality, coupled with her heart for people, inspires me to take my ministry of hospitality to a whole new level. So, as I’m reaching out to her to help with her blog, she’s reaching out to me and helping me with my ministry. Even though we’re separated by over 900 miles, the internet makes mentoring each other possible. We’re blessed already and glad God has stitched our lives together to be eMentors this fall. I hope you’ll visit Nan’s website at www.entertainingforeternity.com to learn ways you can apply Nan’s wisdom in your daily life! We also recommend this post, Thoughts on Mentoring Women in Technology, Part One. Read a guest post from Nan, Using the Web to Cast a Vision for Hospitality. Contact sus dot schmitt at ccci dot org if you’d like to eMentor a fellow staff member. Meet e4e author Leaha Shaikh and read Leaha’s posts on e4e. 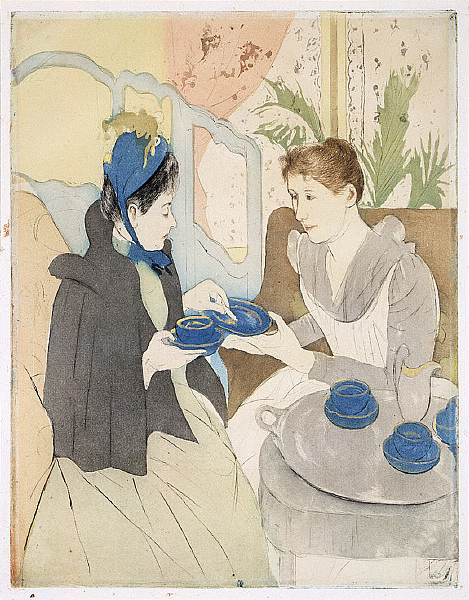 Source: Afternoon Tea Party by Mary Cassatt is in the public domain in the U.S. and was downloaded from Wikimedia Commons.